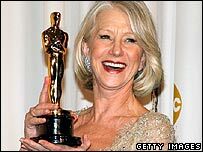 Actress Dame Helen Mirren, who won an Oscar for portraying the Queen on screen, has turned down an invitation to have dinner with the real monarch. Dame Helen, 61, said she made "every effort" to make the date at Buckingham Palace but her filming schedule in the US was "impossible to change". In a statement, Dame Helen said she was "honoured" to have been invited. "This was a gracious gesture and very appreciated by me," she said. "It was therefore hard to have to decline." At the time of the proposed meeting, Dame Helen said she was filming in South Dakota. "I would have made every effort to attend if it had been humanly possible," she said. "I explained this to the Palace officials, and I believe they understood. "I would never have the hubris or the rudeness to insult anyone who had the kindness to invite me to dinner." Dame Helen was named best actress at this year's Academy Awards for her role in The Queen, a fictionalised account of the Royal Family's reaction to the death of Princess Diana. During her acceptance speech, she paid tribute to Queen Elizabeth II. "For 50 years and more, Elizabeth Windsor has maintained her dignity, her sense of duty and her hairstyle," she said. "If it wasn't for her, I most certainly wouldn't be here - ladies and gentlemen, I give you the Queen."